In case nobody told you yet, “happy customers bring more happy customers.” This concept is as old as selling. Sharing customer reviews generates up to 40% higher conversion rates. Well, that must be predictable. Since online customers do not have the option to see nor try a product before purchasing, most of them tend to check the product reviews by previous buyers prior to adding stuff to their shopping cart. This might be somewhat of an oversimplification, but ultimately, the “more” that every business owner wants is revenue, and increasingly revenue is being influenced by user-generated content, especially product reviews. Respondents to customer surveys report that their trust in online reviews is similar to personal recommendations. If the Review feature is not present on your platform, customers are more likely not to shop from your store for quality concerns. To ensure this doesn’t happen, first you have to add this option on all your products, and you’ve got to follow the best-proven practices for mastering the review feature. This is how the top retailers and travel brands are winning triggered product review campaigns. According to a recent statistics, 50+ reviews per product can translate to a 4.6% increase in conversion rates. 63% of customers are more probable to purchase from a site that has user reviews. Site visitors who look into reviews and customer Q&A are 105% more likely to purchase while visiting, and spend 11% more than those who do not interact with UGC. (Bazaarvoice, Conversation Index, Q2 2011). Consumer reviews are noticeably more trusted (nearly 12 times higher) than product descriptions written by producers, according to a survey of US internet users by online video review site EXPO. (eMarketer, February 2010). Reviews produce on average 18% boost in sales. Before we run to our tips to help you increase your product reviews, you need first to understand what motivates people to write a review in the first place? 1- Being Helpful: People who find online reviews useful wants to do their part to share their experiences, it’s all about “Sharing is Caring” for them. 5- Being a Fan of FREE stuff : Some customers review products because they like getting free products to review. 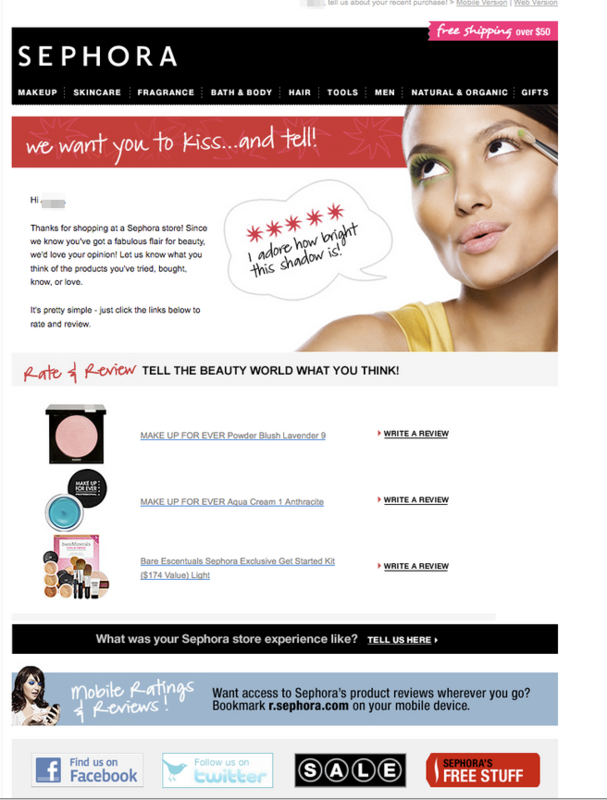 All the top retail brands use the word “review” in their subject lines. For instance, REI uses “Rate the Gear You Purchased – Write a Review at REI.com.” A few retailers, including Amazon and Expedia, include one of the purchased products in the subject line, which has a positive effect on Expedia’s read rates, with trip details in the subject line generating a 10.5% higher avg. read rate than the same campaign without them. Ticketmaster referred to ticketed events in their subject lines, contributing to a 28% avg. read rate for these campaigns. In addition to an automated email requesting a review, TripAdvisor uses different types of triggered campaigns to encourage subscribers to keep the review content coming by highlighting several incidents in the review process. This includes emails to customers who submitted their first reviews, a monthly update to previous reviewers letting them know how many people have checked theirs, and an email telling other users in the subscriber’s network that they just earned a ‘Passport Badge’. TripAdvisor’s subscribers also see their reviews featured in regular promotional campaigns for popular destinations. 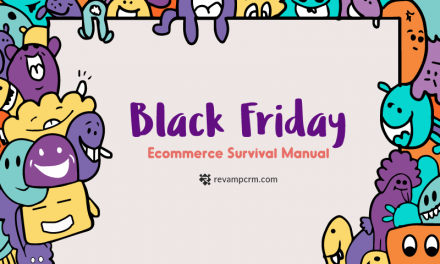 Putting product review campaigns into action might be more challenging than other types of automated emails, which you typically trigger and forget. Challenging factors could be the need to moderate the received content, as well as the touch points linked with requesting and receiving content. 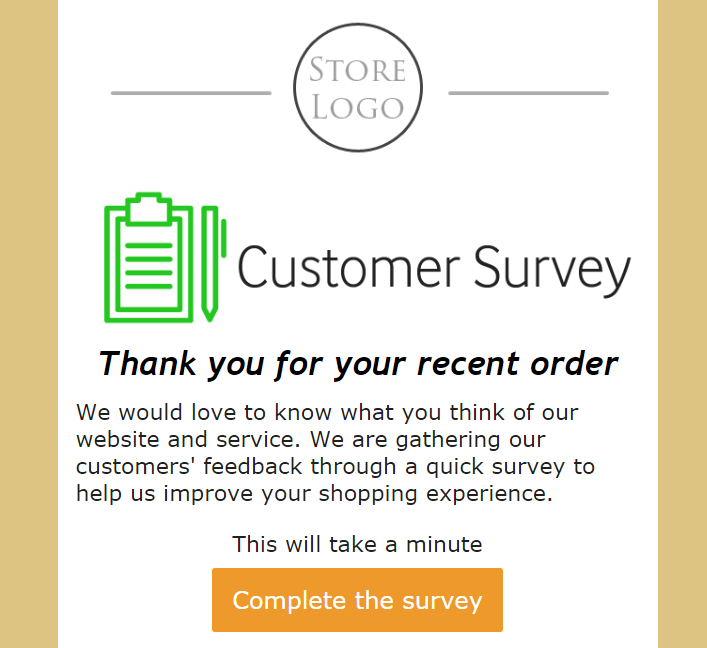 However, these emails can have a direct and considerable impact on increasing purchasing action, particularly for customers who are indecisive or are unfamiliar with your retail. Besides, you will also create a valuable set of customers and subscribers who are voiced, engaged and willing to give feedback. This tactic may not be effortless, but it’s certainly an example of “more is more”. We have good news for you here! With our efficient segmenting and marketing automation tools, you’ll instantly have your customer base segmented, and you’ll be able to send personalized and Review Request email campaigns to your segmented database using our ready-made email templates in a minute. 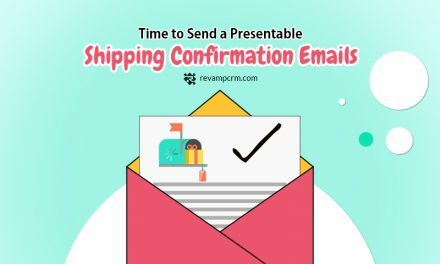 Now go ahead and create your account to enjoy our 30-day FREE trial on http://www.revampcrm.com/eCommerce! A smart customer relationship is all you need to guarantee customer satisfaction, boost your profits, and get lasting results!